No. 2 in height in New York City, that is, ever since workers at One World Trade Center crafted a steel skeleton that took it past 381 meters (1,250 feet) into the sky on the last day of April. 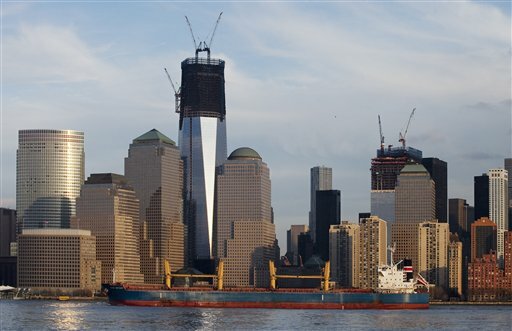 That single tower replaces the trade center’s Twin Towers that fell in the terrorist attacks on September 11, 2001. And its steel beams in the sky put One World Trade Center a tad higher than the tippy-top of the Empire State Building, which had resumed its standing as New York’s Tallest when the Twin Towers collapsed. One World Trade won’t be stopping there. Cranes will eventually raise it to a symbolic 1,776 feet (541 meters), allowing it to reclaim the title as tallest building in all of America. The symbolism derives from the year 1776, when the United States declared its independence. But this is about the old, not the new, champion: the 81-year-old dowager high-rise. 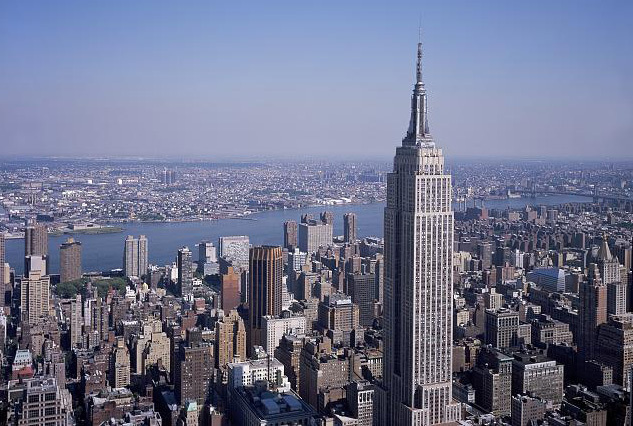 On the affection meter, not just in New York but also nationwide, the Empire State Building ranks No. 1 by far. Five years ago, the American Institute of Architects marked its 150th anniversary. To celebrate, it invited Americans to choose their favorite building anywhere in the land — a steel tower, a beloved monument or memorial, a spectacular bridge, perhaps an iconic mansion. The AIA announced the results on a Web site that showcased the top 150 structures in order of the esteem in which they are held. I know about this because Carol photographed each one of them for the site. The White House finished second. The dramatic National Cathedral, also in Washington, placed third. San Francisco’s photogenic Golden Gate Bridge came in fifth. For once it wasn’t just New Yorkers — the ones who see nothing amiss in artist Saul Steinberg’s cover of the March 29, 1976 New Yorker magazine — who were bragging about their big building. Steinberg’s cartoon is a map, of sorts — it shows New York City stretching four-fifths of the way across the country, with the Hudson River flowing roughly where the Rocky Mountains stand and only a bunch of buttes and a dot or two, marked “Nebraska” and such, from there to the Pacific Ocean. Turns out, even people in Nebraska have a soft spot for the octogenarian New York skyscraper. I was one of millions of American schoolchildren who’ve taken excursions or gone with family to New York City from the boonies. Ohio, in my case. I’ve forgotten most details of the adventure except those involving the Empire State Building: gaping, slack-jawed in amazement, out the bus window from New Jersey at its domineering silhouette across the Hudson; standing beneath it; craning upward in wonder; riding what seemed like rocket-launched elevators to reach the observation deck nearly half a kilometer above Fifth Avenue. And, of course, standing on top of the world, surveying what looked like Forever before me and “ants” far below. Yellow Cab ants. Bus ants. Tinier people ants. For my VOA colleague Adam Phillips — a New Yorker who’s pleased to be working out of our New York Bureau — affection lingers for the brawny skyscraper. He and his chums would ride up to the lookout platform, inside which he dimly recalls a packed “200-foot lunch counter” — fond memories play tricks; 200 feet, or 70 meters, would be twice the length of a football field. That would stick out the window and well beyond, I think. Now that WOULD be some hamburger and Coke experience! Ever the curious sort, Adam remembers peeking under the counter and beholding a “rainbow of colors” from the chewing gum that customers had stuck there. He says he tossed a hat off the deck and soon lost sight of it as it looped to earth somewhere below. With little regard for the consequences, he and his buddies may have sailed pennies into the wind — he ain’t sayin’, as New Yorkers would put it — wondering if it were true that they would land with such ferocity that they’d dig three meters into the earth. I don’t recall ever seeing such ruts or the bodies of impaled passersby, so the danger of pennies from heaven was probably overrated. 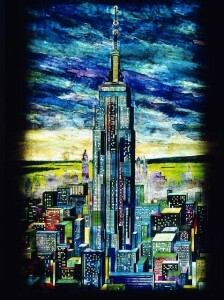 “For New Yorkers, the Empire State Building has always had dramatic, masculine virtue,” Adam tells me. 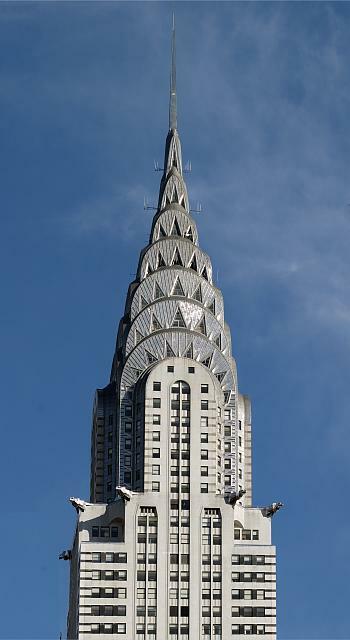 “A swagger — quite the opposite of the delicate, crystal-champagne look of the Chrysler Building” a few blocks away. 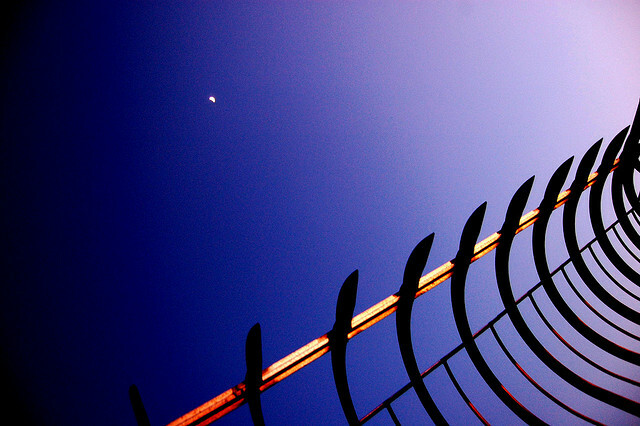 Human societies have always built great monuments to celebrate their values. The Egyptians had their pyramids. Medieval Europeans had their great cathedrals. 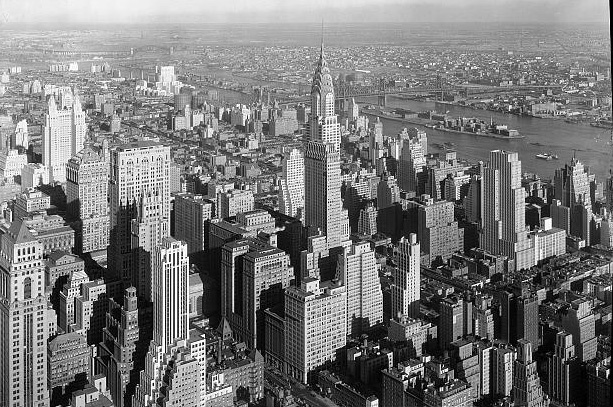 For 20th century Americans, it was the skyscraper that best embodied the power and progress that defined their era. 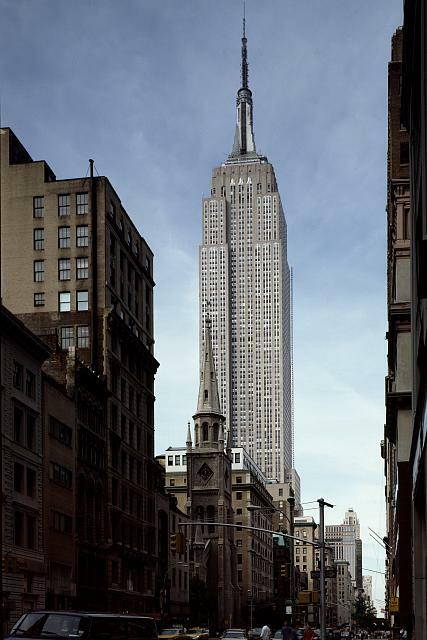 If it could talk, the Empire State Building would doubtlessly note that the Chrysler spire, its fierce old rival uptown, finished ninth on the AIA list of Americans’ favorite structures. The previous skyscratching champion — the century-old Manhattan tower called the Woolworth Building — placed a paltry 44th. 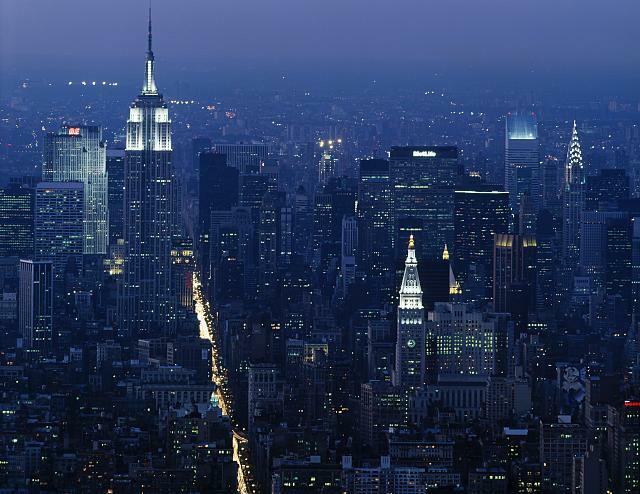 Two other lofty New York landmarks placed even farther down the list. Rockefeller Center was 56th; the well-known United Nations Building a distant 111th. Even Chicago’s Sears Tower, now called Willis Tower — the nation’s tallest structure when the AIA survey was conducted — finished only 42nd in Americans’ regard. Lumping these behemoths together brings to mind the frantic race for supremacy in the sky when they were created. In 1913, F.W. 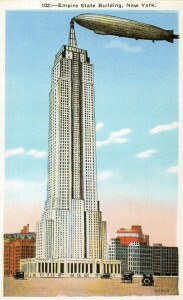 Woolworth took some of the sizeable profits from his nationwide five-and-dime store chain and built the 241-meter (792-foot) Woolworth Building, which stood as the world’s tallest tower for more than a decade. 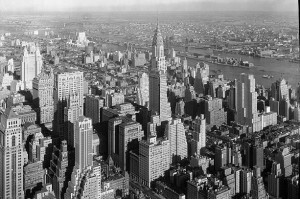 Then, thanks to engineering breakthroughs and a robust economy in the 1920s, two skyscrapers shot past Woolworth. The race into the sky was on, thanks to Chicago architect William Jenney, who proved that a steel skeleton could support a really tall building. Previously, masonry walls had to be thick and stout to bear the weight of several floors above them. Seven or eight stories was about the max. Just as 40 Wall Street was prepping for its “World’s Tallest Building Raises the Stars & Stripes to the New York Heaven” ribbon-cutting ceremony, Van Alen’s crews at the Chrysler site were secretly building an altitude-busting spire — inside the structure itself as it rose. Then they lifted and mounted the 27-ton steel tip without saying a word to the press. Four days after 40 Wall Street threw its celebratory bash, Walter Chrysler calmly pointed out that his creation had bested the bank building by 30 meters. 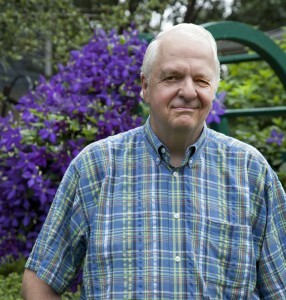 The gloating did not last, though, for another automobile mogul, former General Motors executive John J. Raskob, outdid him in a, well, New York minute. On the site of the renowned but fading Waldorf-Astoria Hotel — which he promptly razed while the hotel reopened elsewhere — Raskob and his investors thrust the Empire State Building into the sky at a rate of two floors a week. 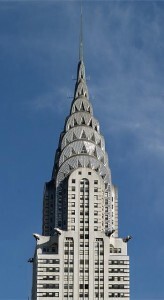 The answer was unreported, but the result was a masterpiece, 70 meters (200 feet) higher than Chrysler’s tower. Raskob got his record, which the building would hold for 40 years. Reading all this, you must think that the Empire State Building was a commercial palace: opulent, prestigious. Not really. It had the misfortune to open in 1931, just as the Great Depression was draining the life out of the nation. 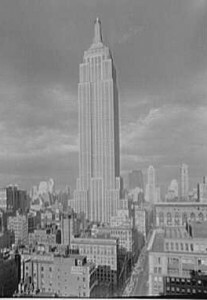 Three-fourths of the Empire State Building’s offices went unoccupied, and the giant was soon mocked as the “Empty State” Building. Not until the 1950s did the building turn its first profit. And it was hardly luxuriant. 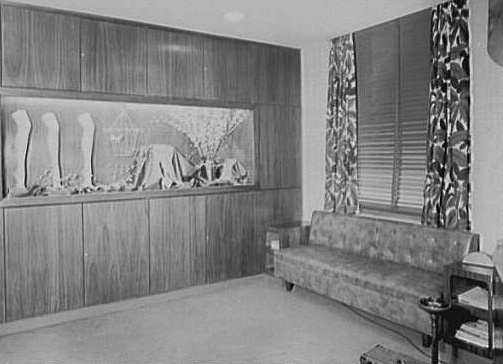 Picture one of those 1940s noir movies, in which a chain-smoking businessmen in a fedora hat walks down a dim, marble corridor, through a smoky-glass door, and into his tiny office. 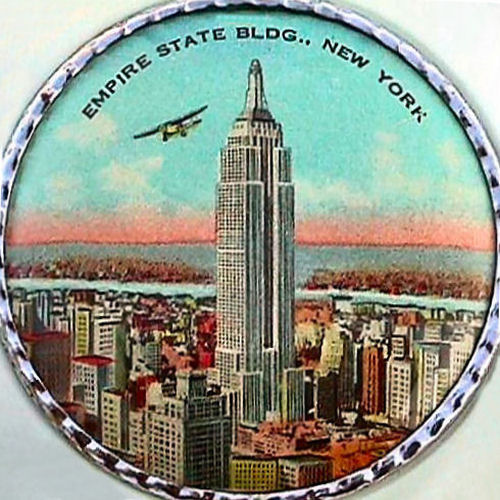 Although the Empire State Building address was prestigious, the building was mostly home to small shops — diamond merchants, watchmakers, barber shops and the like — and nondescript wholesalers. And it turned dingy as it wore out over the years. In a $500-million renovation in 2006, its current owners spiffed up the fixtures and improved climate comforts. And this year, they announced they were taking the building public with a stock offering that they hope will bring in as much as $1 billion in new capital to further enhance the landmark. King Kong: In 1931, the year that the building opened, the long-awaited movie from a popular book about a misunderstood giant ape hit the screen. 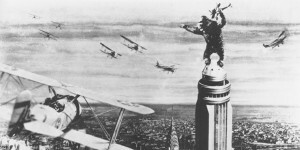 Audiences were mesmerized as the beast — having just escaped from captivity at a one-ape freak show — climbed all 102 stories to the top of a bad mock-up of the Empire State Building, where he swatted away buzzing biplanes before falling to his death in a hail of machine-gun fire. 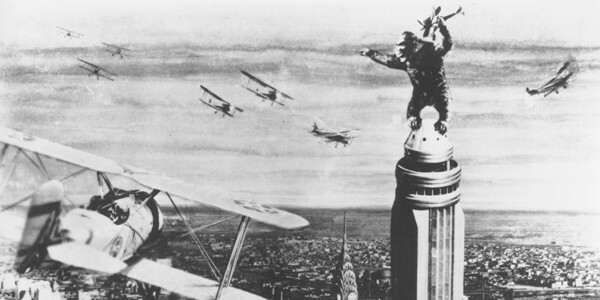 There’s more, including Kong’s love-struck infatuation with a blonde played by Fay Wray, but it has little to do with the New York tower. Dirigibles. 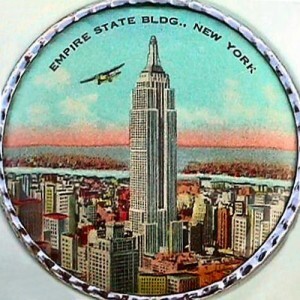 The art-deco spire of the Empire State Building was fancifully designed as a docking station for lighter-than-air ships at a time when they were the rage. A famous photograph shows the cigar-shaped dirigible Los Angeles docked nose-to-steeple there, but the photo was a fake. No German Zeppelin or other airborne gasbag ever hooked up and sent passengers down a gangplank into the building, as planned. A few floating airships approached for publicity shots but were so buffeted by high winds that the docking scheme was abandoned. Plane crash. This tale is true. On a foggy Saturday morning in 1945, a B-25 bomber, piloted by an Army lieutenant, crashed into the north façade of the building, 79 stories up. Fourteen people died, a dislodged engine landed on a roof far below, and the other engine and the plane’s landing gear ended up in an elevator shaft. There, they severed the elevator cables and fell 75 stories down the shaft, along with the cab. To her great misfortune and terror, operator Betty Lou Oliver was inside. She somehow lived to tell about what still stands as the Guinness World Record for surviving an elevator fall. Suicides. Thanks to a higher fence installed on the observation terrace in 1947, and a skirt of curled metal spikes around the perimeter, only an estimated 35 people have jumped to their deaths from the top of the Empire State Building. Compare that with the more than 1,200 people known to have taken fatal plunges off the Golden Gate Bridge. It seems odd, and a little macabre, to end this posting with another suicide anecdote, but I find this miraculous: In 1979, a woman named Elvita Adams leapt off the Empire State Building observation deck at the 86th floor, only to be blown by a sudden gust of wind back through a window one floor below. She sustained a broken hip and, one would hope, a different outlook on life. Boonies. The sticks, remote parts where people aren’t very sophisticated. “Boonies” is short for “boondocks,” a Tagalog-language word that carries the same meaning. Dowager. While the word literally applies to an elderly woman of high standing, it is often applied to once-glamorous, now fading buildings as well. Five-and-Dime Store. A retail outlet found in almost every American town and city, especially in the mid-20th Century, in which prices were as low a nickel (five cents) and a dime (10 cents). Gape. To stare in amazement, often with one’s mouth open. New York Minute. An instant, or really, really quick. Faster than the New York cab driver behind you can honk his horn at you. That’s fast! Octogenarian. A person in his or her 80s. The “octo” prefix also shows up in words such as octopus (eight legs) and the newer “octomom” — mother of eight. Enjoyed your article, but a football field is 300 feet from endzone to endzone or 100 yards. If you add in the 10 yard endzones it is 360 feet long. It seems reasonable that if the foodcourt at my local shopping mall is 200 feet long (or a little longer than 1/2 of a football field), that the food counter at one of the most visited tourist traps in NYC could be that long. I visited Empire state building yesterday and it was ONE of the most pathetic experiences ever so far. The whole crowd was not managed and the employees lack of apathy and zero communication leaves a lot to be desired. 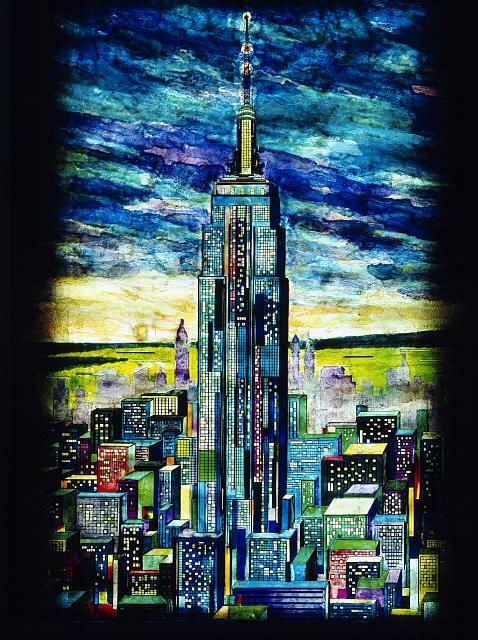 To tout all the pictures and talk about only positive things about empire state building will only leave to short sightedness vis-a-vis the scalping for express tickets happening in and around the building. Dear Matty. You’re absolutely right. In fact, I caught that myself and neglected to correct it — but will now. Moving around in feet and meters and yards as we do in international broadcasting, I sometimes mix ’em up. Thanks for catching that.